Swami Adbhutananda was a disciple of Sri Ramakrishna. Although he never underwent any formal education and did not know how to read and write, he was held in high respect for his spiritual achievements, pure life, simplicity and the insights into spiritual life. 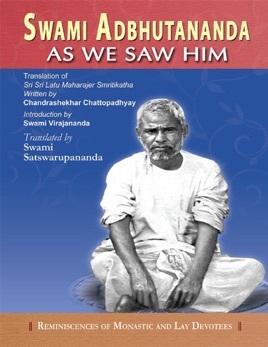 This book, a translation from the original Bengali ‘Sri Sri Latu Maharajer Smritikatha’, is a charming account of Swami Adbhutananda’s association with Sri Ramakrishna, Holy Mother Sri Sarada Devi, Swami Vivekananda and other disciples, as also provides intimate glimpses of his austere life, devotion to God, dispassion towards the world and intense spiritual practices.